I think it’s been established, I have quite the past. I’ve been a beet-hater (now, a lover). A Chick-Fil-A and fast food lover (before real food). 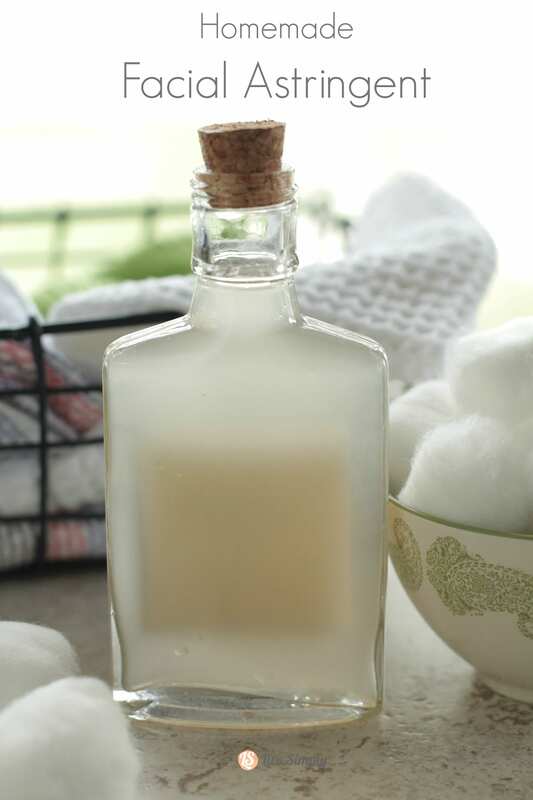 I recently gave up store-bought laundry soap (thank you awesome homemade recipe), but still have yet to give up shampoo (I just can’t do it, yet). If it smells of toxins, I’ve probably smeared it on my body or eaten at least a few bites in my lifetime. It’s true! Over the past couple of years I’ve been on a mission to not only remove the “dirty” ingredients from our food, but also our personal care products. It hasn’t always been easy. I’ve had some serious ties to many toxic products. Some nostalgic (the smell of Tide), others just too comfortable to give up. The thought of switching store-bought products for homemade versions seemed complicated, far from simple. I slowly started with my go-to product, foundation powder. Hey, I love my make-up. It’s magical, remember? I was pleasantly surprised how a few simple ingredients and five minutes could make a great product that was safe for my skin. Easy peasy. Since that first experiment, I’ve made: lotion/body butter, surface cleaner, body wash, toothpaste, laundry soap, vapor rub, and boo-boo cream. Last month I switched-up my homemade skin-care regime. Even with my homemade lotion and natural face wash, I was noticing increased break-outs and peeling. After good counsel from my friend and natural skin-care guru, Jessica, I decided to change things up and create a new lotion/body butter recipe. Every good skin-care regime needs a bit of a change every now and then. Jessica also recommended trying an astringent after washing and before moisturizing. At the mention of “astringent” my mind drifted to my teenage days and the expensive blueish-green bottles of Clinique. For years, I used those toxic bottles of astringent, never noticing any improvement to my skin (probably more damage). Finally one insightful day, I realized I was much too poor for $30 astringents. For nine years, I haven’t used any astringent. With the mention from Jessica I decided it was time to revisit astringent, but this time with a homemade version. With three simple ingredients I was able to make a pH-balanced, homemade facial astringent recipe, for just pennies. In fact, the ingredients for this simple and natural astringent were already in my cabinets, just waiting to be used. This recipe is made with three simple ingredients: distilled water (yes, you need distilled), Apple Cider Vinegar, and a few drops of essential oil (optional, but helpful). The simple ingredients create an astringent that tightens pores, keeping the unwanted junk from entering. Much like the Avengers– protecting and defending you from all the bad guys wanting to wage war on your lovely pores. If you have oily skin, like myself, this astringent is your new best friend. Simply apply using a cotton ball, after cleansing your face in the morning and evening, and follow with a moisturizer. With three simple ingredients I was able to make a pH-balanced, homemade facial astringent recipe, for just pennies. In fact, the ingredients for this simple and natural astringent were already in my cabinets, just waiting to be used. 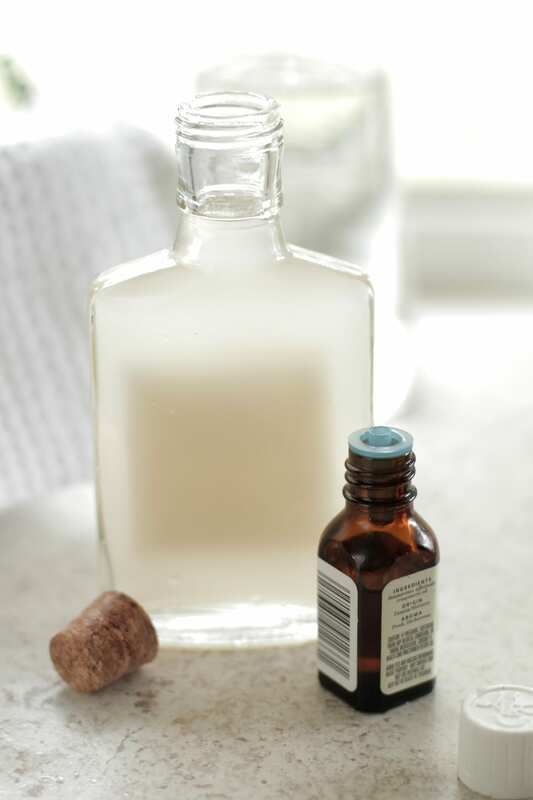 In a large bottle (use glass, if using essential oils) combine the ingredients. Shake well. To use, Keep on the counter away from direct sunlight. Apply a small amount to a cotton ball or pad and wipe face. This sounds amazing, can’t wait to do it! I’m a new reader so I’m still going through all your past posts for more awesome ideas and recipes. I came across the homemade Neosporin. I don’t have much knowledge on essential oils but once I saw in your post that a few are antibacterial….do you think it’s possible to make a natural hand sanitizer spray? Instead of ACV, can I use kombucha? I have some that fermented a little too long and is more vinegary than it should be. Thank you. Hi Lori, I’m not sure about Kombucha. My concern would be the tea and how it would effect the skin. Maybe try a small amount on a test area of your skin- like your hand- and see what happens over a week. Let me know how it works. Hi! I recently stopped using my old commercial cleanser and started oil cleanising. I’m 45 and have always suffered with really oily skin and have been a scrubber as well. This year, my skin took a turn for the worse– actually, the worst it’s ever been in terms of redness, dryness, and peeling. Nothing I put on it made any difference and actually made it worse. I worried (still do) that I have developed rosacea or some sort of food or other allergy. Coconut oil made my jaw itch, made my skin even drier and more irritated, and made my eyes red, itchy and dry when I made a make-up remover with the oil. I switched to grapeseed oil with a few drops of argan oil which seems to be much less irritating. Just using oil for moisturizing after oil washing was not sufficient, so I started using Avalon Organics Lavender night cream that I really like for morning as well. Hi Jimae, I’m so glad you’ve found some products to work for your skin. I’ve had the same issue over the years, it’s taken a lot of tweaking to find what works just right for my skin. For the astringent, I know people with oily to acne prone skin usually find astringents very helpful. I’m not sure about drier skin. I might test a small amount on a small area of your skin, and watch the response over a week. You could even make a much smaller amount of this recipe for testing purposes. I’d also go with something like lavender for the EO, for a calming effect. Let me know how it goes. I would like to start using essential oils for cleaning, skincare and more but I am a newbie at it. When looking for essential oils should I look for 100% therapeutic, organic…what are the tag words I should be aware of? What brands have a good reputation over other brands etc? I haven’t been using anything special on my skin for so long and it would be great to make my own. I can’t afford to go out an buy all the ready made pure and healthy skincare that is out on the market. Thank you for sharing your experiences and recipes! It gives me somewhere to being! Hey Jennifer, I completely understand the not being able to afford all the pure and healthy skin care out there. That’s the main reason (and the assurance of the ingredients) for making my own products. The cost of making your own can be a little costly up front (if you don’t have the supplies), but once you have what you need, a few ingredients make a ton of different products and saves lots of money. As far as essential oils, there aren’t many certified standards. So, when a company says, “therapeutic” it’s not a certified credential. Most oils on the market from reputable brands are therapeutic. “Organic” does carry weight as the plants which the extracts come from can’t be sprayed with toxic chemicals. For some oils this can be important and others which aren’t likely to be heavily sprayed, it’s not. I personally love Plant Therapy brand. You can find them on Amazon or through their online retail store. I also have a local herbal store that sells their own blends. Here’s one of the best sites for information on essential oils: http://www.learningabouteos.com/. Thanks for sharing this recipe as well as the moisturizer one. These seem like they could be exactly what I need. Do you have a favorite cleanser for your face? Or do you use the body wash recipe that you generously shared with us? Hey Sarah, You’re very welcome :). I use sweet almond oil (this–>http://amzn.to/1kJDpQT) on a cotton ball to clean my face. I simply squirt the oil on the cotton ball and wipe my face. I wash the oil off with a warm, wet washcloth. The oil removes the dirt and make-up from my face. I follow up with this astringent and the homemade lotion. Great, thanks. Do you use it alone or with a carrier oil? I am 34 and have combination skin that rarely breaks out. However, it is starting to look “tired”. I have no skin care routine to speak of and never wear makeup. So I simply need to find a way to get my glow back. I am a happy wife and blessed homeschooling mama of 5 boys, and honestly makeup seems like a lot of extra work at this time in my life. Hopefully just a little extra TLC is what my skin needs. Hey Sarah, The almond oil is a “carrier oil” vs. an essential oil, so it’s very safe to use directly on the skin, just like you would with coconut oil or another skin-appropriate oil. I’m thirty this year and have noticed my skin looking tired, but between this lotion, the astringent, and using the oil to cleanse, my skin is looking healthy and refreshed again. Also, consuming health fats: grass-fed butter, healthy oils- coconut and olive oil, and drinking homemade broths can really help with skin collagen. This looks so easy! Do you find the lemon oil causes any sun sensitivity to your skin? I’ve read that it could and wondered if the tiny amt in this recipe would be an issue. Thx!! Hi Megan, That’s a great question. There is very little essential oil to liquid (water and ACV) in this recipe, so the lemon essential oil is okay for stepping out in the sun. If you plan to go to the beach for a day, I may skip the astringent. Hello! I was wondering about how to store the astringent, and also how long its shelf life is since it has water in it? I would ideally like to keep this in my bathroom for easy access 🙂 Thanks! Hey Meebs, If you’re using distilled water the astringent will keep for at least a couple months. If using regular water I’d only keep it for a couple weeks to prevent bacteria growth. I store my astringent on the bathroom counter. I have been using ACV / water as astringent for a couple years and totally love it! I also sometimes mix in some green tea for antioxidants too! Hey Shirley, That’s awesome. I love that something so simple can be incredibly effective! What a great idea to add green tea…I need to try that next time. Hi Kristin, you mention using natural face wash. What do you use/recommend as a natural face wash? (BTW I have fairly dry skin) I’ve been working towards using less and less chemicals in our lives also and prefer to make my own when possible. Hey Cindy, Great question! I use the oil-cleansing method to clean my face. Here’s a bit more information on the oil-cleansing method and what oils are appropriate for various skin types: http://www.auracacia.com/auracacia/aclearn/oil-cleansing-method.php?utm_source=post&utm_medium=twitter&utm_content=oil_cleansing&utm_campaign=carrier_oils. Hey Maureen, I don’t have a recipe for eye puffiness, yet. I think I need to create one! I’ll let you know what I come up with. I used ACV straight (no water) to clear up my cystic acne condition. It has worked wonders! If you have more stubborn problem skin, you may want to play with increasing the ACV. Go Bragg’s ACV! Good to know. Thanks for sharing, Tanya. I use water/acv as an astringent. My skin is combination and it works well. I’ve slowly been getting into using essential oils and love the brand Plant Therapy too. 🙂 I read that geranium eo is great at balancing oily/dry skin. I think I should buy some and add that in. That’s great, Melissa! I’ll have to add geranium to my next astringent. Hey Ellycia, Thanks for sharing. Very interesting. If geranium essential oil is used in the correct dilution amounts (which is very small), I haven’t read about any issues with it. I know geranium may be used to help with menstrual cramps. Can you share the research supporting their belief? I’d love to read more about this. Thanks for sharing. I haven’t read in all my research about lavender causing cell death in a way that it shouldn’t be used on the skin. It’s actually used in many salves and remedies to heal, even for burns. Lavender is also one of the few essential oils that can be applied neat (directly to the skin.) Can you share the sources for this information. I’d love to read more. Yay! I am so glad I found an easy & effective recipe for an astringent; thanks! Your post about spending all that $$ for years made me chuckle because that’s my story with eye-makeup remover. Bottles & bottles of the stuff & now I use a simple, 3-ingredient recipe to take any & all makeup off, without leaving any oily residue! Just distilled water, olive oil & Dr. Bronner’s soap. Voila! 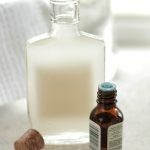 Found the recipe here: http://domesticatedduchess.blogspot.com/2012/04/homemade-all-natural-eye-makeup-remover.html. That’s awesome, Vicki! I love how simple remedies save money and work so well. Thank you for sharing. Enjoy!! Citrus oils can be very (very!) harsh on the skin, particularly if not applied with anything to dilute them. Thank you for sharing, Colleen. Enjoy the astringent. Do you think adding a drop or two of tea tree oil would be beneficial for acne prone skin? Hey Jeni, Tea tree oil would be a great addition to the facial astringent for acne-prone skin! Where do you get your bottles and containers to put your things in? Like the astringent and powder foundation and so on. Tia! Hey Sabrina, I find many of the containers and bottles at HomeGoods or Target (the $1 section!). I also like to use mason jars and Weck jars for homemade products (I purchase both online). I went a little crazy a few days and threw out all of my face drugstore/high end products that are full of chemicals (moisturizers, cleansers, toners , black head removers, face wash even my DEO etc) and without having a back up plan. So now I am in the search for replacements. I have successfully made my deo ! yey! I made a simple baking soda toothpaste which cleaned my teeth really well, but my mouth still stunk (tmi?) and… when I flossed my gums burned so badly so I think the baking soda is too harsh for me so I have been oil pulling with EVOO and simply flossing , or brushing my teeth with straight coco oil until my Earthpaste order arrives in the mail (yey!). So now , I am not sure what to do for a facial cleaning routine. I ended up ordering a make up remover and cleanser from Origins because I panicked… so now I need a toner and a moisturizer. Would this astringent recipe be considered a toner? Step 2 from clinique? haha( we have all put those chemicals in our faces before :S ) I have also heard about washing your face with oil … castor oil with almond oil or along those lines. I have sensitive oily skin but not super oily but always get pimples. I am a little scared to wash my face with oil… but I am wiling to give it a try. My question is…. if you wash your face with oil this will cover step 1 as face wash and also step 3 as moisturizer correct? and also make up remover? So then you would only have to apply this astringent afterwords ? And your done? I am scared of using coco oil in my face so thats a no no for me. I apologize for my super long comment. I am all alone in this journey and dont know who to ask! Hey Claudia, Thank you for sharing your journey!! For the toothpaste, a lot of baking soda can hurt your gums. I use baking soda in my toothpaste, but try to keep it minimal compared to the other ingredients. I replaced the Clinique toner with this astringent and found it to be even more beneficial for my skin. 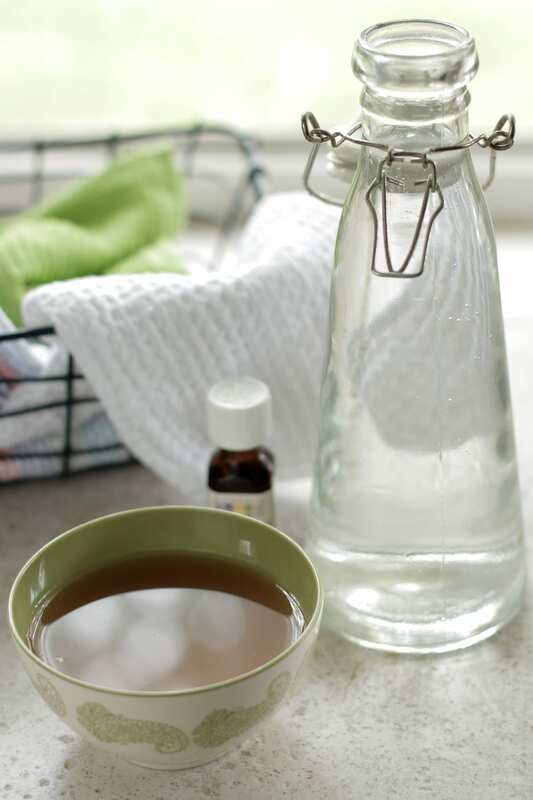 Right now, I oil cleanse as much as possible throughout the week, but keep a homemade face wash handy for the nights when I just want to go to bed (without the extra oil cleansing effort). I found my skin really needed a bit more, on top of the oil cleansing (I have acne-prone skin), and use this astringent (which balances PH) and a homemade lotion. For me, this routine works best. Some people prefer just oil cleansing without an added astringent or lotion. I quickly wanted to mention that you don’t have to use distilled water to prevent bacteria from growing in your toner. In water, you always have a certain amount of bacteria. You have to use distilled water to prevent reactions from happening in your toner as bottle water or water from the tap contain minerals. However, you can use these types of water if you want. If you want to higher the healing power of your towner, I would advice using aloe vera juice, rose water or green tea infused water. I really lik using tea for toners! i’ts nice to experiment with. I just happened upon this website and been reading it for over 45min. I’m trying to go natural on my skin as I did with my hair. Question: do these recipes work for an African dry skin? I tried coconut oil as a moisturizer and ended up with a dry skin. To what extend do your recipes work for my skin? Hey Mwihaki, Welcome to Live Simply! I’m Caucasian so I don’t have much experience with African dry skin. I’m sure many of the ingredients could be googled or researched before using them to make sure they will compliment your skin :). ACV is great as a toner for oily and acne-prone skin. So is witch hazel. Mine is dry so I use white tea (even more antioxidants than green tea) and rose water which are working very well. I haven’t experimented with EO’s yet but I guess lavender oil would work and I think neroli and ylang ylang are good for dry skin but I need to check to make sure. I just found your website and I LOVE it. Thank you so much, Melanie. The tea and rose water combination sounds great! Hi, I am new to the world of DIY skin care products and chanced upon your website while researching on this topic. I wanted to thank you for sharing your knowledge with everyone…your website is very informative! I just made the astringent using your instructions and intend to try out the skin care regimen you mentioned. I do have skin which is on the drier side though, so hopefully the astringent still works for me. Welcome, Anu! My skin is more on the oily side, but I believe this astringent will also work for dry skin (maybe just reduce the number of times you use it each week). Let me know how it goes! Hey Ria, You could try lemon juice, but just watch out for sun exposure. Such a cute bottle. I’ve always used plastic bottles before because I’m terribly clumsy, but besides practical it seems to be more beneficial to switch to glass. Hey Julie, Many people believe glass is a better choice for storing recipes using essential oils, particularly long-term. The essential oil(s) really help mask the vinegar smell which is rather strong, lol. 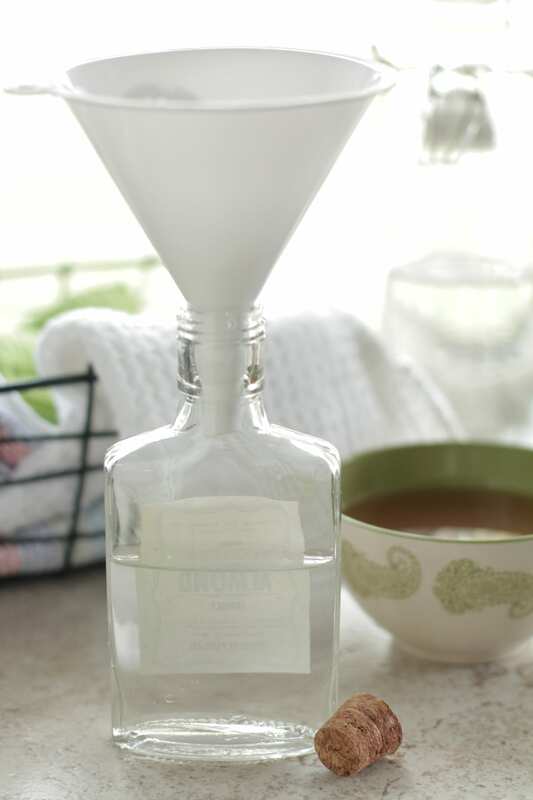 I have a new astringent recipe coming out this weekend (similar, but a bit different) :). You’re welcome, Roselle. I think you’ll really like this solution–I use it every night after washing my face :). – Facial cleansing with facial cleanser I’ve been using for years. If I’d like to include the astringent in my routine, when would you say I should include it. I have dry skin that gets oily after a couple of hours so I figured astringent would be good. Should I use the astringent before primer? Hey Sarah, Your routine sounds very similar to mine. I suggest using the astringent after the facial cleanser. You could also use this recipe as a spray versus a “rub on” astringent. I’ve rotated between both methods with great success. The astringent will help restore the skin’s PH level. I found your website through your homemade foundation video. This looks awesome! : ) I’m a teenager and I just use water to wash my face and a moisturizer/lotion. I’d love to try these recipes out and maybe share them with my sister and mom. My mom has tried making some of her own makeup and I think she would think this is cool too. Awesome, Charlotte! I’m so glad you’re loving the astringent!! 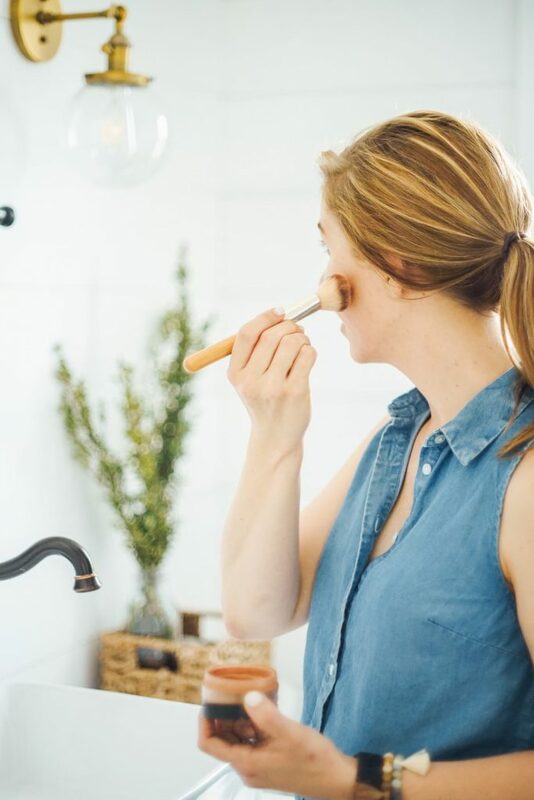 Hey Kristin, I am an absolute newbie to this kind of DIY home facial care and I am now serious about starting my journey with your products; I’m not going to mix with any other homemade recipes and will simply stick to your skin care routine. I am also planning to film my face on days (let’s say) 1, 8,15,22 and so on and see how it goes. I do not see anything in your products that may damage my skin, so, here I am, ready to devote my next months to a strict facial care. One BIG problem, though: I don’t know the order of what and when (yep, you are right to laugh)! Even though I am nearly 49, I have barely used any facial products, apart from yogurt on my face and, thanks to my mum’s gene, my skin looks pretty good for my age, but I’d like to start showing it my respect. So, if I was to start with your facial products, what should I start my DAY with and how I should END it? I am totally unaware of what comes after what. Hey Rosi, I love your comment :). I can’t wait to see and hear about your journey. I recommend reading this post to see my full routine: https://livesimply.me/2015/10/14/my-natural-skincare-routine/. I keep my morning routine simple these days. Upon waking, I take a shower and rinse my face with water. I wash my body with castile soap (I love my homemade body wash recipes, but right now my time has been spent making other homemade products). That’s it! I still use a store-bought shampoo and conditioner since I haven’t been able to find or make homemade versions that work. Just being honest, friend. For body lotion, I’m currently using Everyday Shea. I love my homemade lotion recipe on the blog (https://livesimply.me/2014/04/16/homemade-moisturizing-lotion-recipe-no-coconut-oil/), but at the moment I know a decent store-bought lotion exists so my time is better spent elsewhere. My evening routine involves a three step process (think: Clinique goes homemade). After tucking the kids into bed, I rinse my face with water and massage my face with an aloe and honey cleanser. The cleanser is washed off using a wet wipe (I’m in love with these wipes for facial cleansing!). Next, I move on to balancing my skin’s pH with apple cider vinegar. I don’t have a recipe for the current moisturizing serum I’m using. The idea came to me after reading a comment from a reader a few weeks ago asking about a rosehip and argan oil mixture for aging and acne-prone skin. Since my skin qualifies as both aging and acne-prone, I decided to mix these ingredients at a 1:1 ratio along with a few drops of frankincense essential oil. I love this mixture so far. Over the spring and summer seasons I used the serum recipe on the blog as a moisturizer (https://livesimply.me/2015/01/18/diy-homemade-facial-serum/). As cooler and drier air approaches, I may switch over to my homemade lotion recipe (https://livesimply.me/2014/04/16/homemade-moisturizing-lotion-recipe-no-coconut-oil/), but for now the rosehip/argan mixture works nicely. 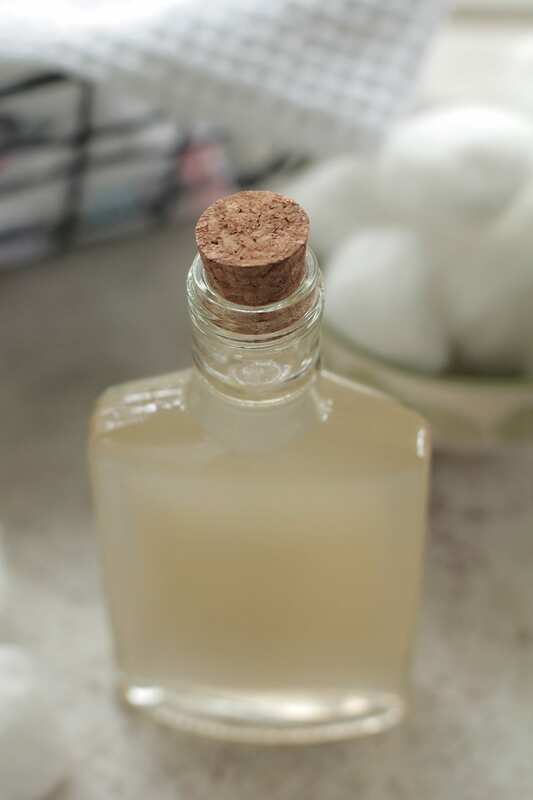 Another option, if your skin likes coconut oil is an easy coconut oil moisturizer (https://livesimply.me/2013/09/18/simple-homemade-moisturizer/). Another wonderful recipe. I can’t wait to try it myself. Btw, would you mind if I upload this page link to my blog? It’s still under construction, and I am implementing everything I find useful and inspirational ???? Hey Davinia, Thank you! 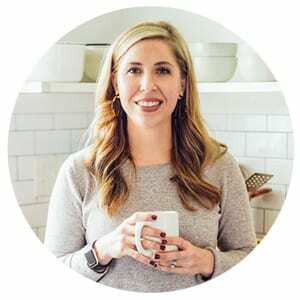 Yes, you’re welcome to link to Live Simply on your blog–thank you for asking! Hi, can I know if I can change Aaple Cider Vinegar to different type of vinegar example pomegranate vinegar? Hey Liyana, I haven’t tried anything besides apple cider vinegar. I’m not sure how the other vinegars would perform on the skin (or if they would burn, stain, etc.). You could try testing a small amount on your hand for a week. Personally, I would stick with apple cider vinegar. Hi Kristin–is this raw, unfiltered ACV or regular, run-of-the-mill ACV? Hey Stephanie, Preferably the raw unfiltered vinegar :). Hey Cindy, I haven’t heard of Marula oil, so I did a quick Google search. It looks like people use it for skincare. Maybe it’s like coconut oil–which is also high on the scale–but some people swear by it and others breakout. I’m guessing it might be good for the skin, but can also clog pores. I’m not sure why it would be labeled as non-comedogenic. Hmmm…I personally would stick with an oil like grapeseed then. I love sweet almond oil for my acne-prone skin, especially when mixed with aloe vera. That’s interesting, Jenn. Thanks for sharing! Hi Kristin, I want to try this recipe. Can you please tell me what is the difference between astringent and a toner? I’m not sure which one will be good for. Than you for I’m advance ? Hey Elba, Astringents are usually alcohol based (from my research). That’s the big difference. Toners aren’t as harsh on the skin. 🙂 I personally use this “astringent” (a word I chose just because that’s what most people associate with the product used after cleansing to tone the skin) every night. Kristin, thank you for your explanation. I made this facial astringent, and I like it. It keeps my little breakouts away. I will try the one with camomile next time ? I’ve read (and tried) that you can use witch hazel with the ACV and essential oil, then you don’t have quite the issue as you do with using water. Also, for those with acne prone skin, a few drops of tea tree oil helps greatly. Hi, just wondering if I can use orange essential oil instead of the three you listed. Thanks! Hey Christine, Yes, you could. You can also skip the essential oil, too. Trying this mix out with witch hazel instead of water. Crossing my fingers! Hey Jessica, Let me know how it goes. I have made both the aloe honey face wash and the astingent. OMG so far I love both. My face feels so soft and supple. This is the first night I used both. Am hoping that age spot will fade away as well.